Join host Kelly Galea for this interview with feng shui expert Karen Rauch Carter as Karen teaches simple techniques to activate your home or workplace to ensure optimal health, wealth, happiness and more. This show will help you to make the most of your living spaces using Karen’s best-selling feng shui book entitled of course, Move Your Stuff, Change Your Life. You’re encouraged to have your floor plan (hand drawn is OK) and pictures of your living spaces handy for the fun, unique, and enlightening Q and A time. Click on the Listen Now button below to enjoy this episode. Feng shui consultant and healthy lifestyle designer, Karen Rauch Carter has an amazing ability to take the ancient art of feng shui and not only make it accessible and relevant, but make it fun! She has spent decades learning how to quickly create healthy, vibrant lives for her clients, and effortlessly translates that information into her easy-to-learn talks. 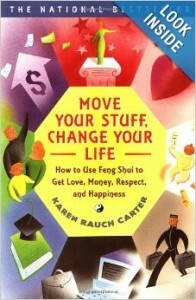 Her national best-selling book Move Your Stuff, Change Your Life is considered a classic in the field of feng shui. As well as being an expert and best-selling author in the field of feng shui, her credentials also include being a licensed landscape architect, a certified bau-biology practitioner, a longevity health counselor and a peak performance coach. Her light-hearted approach to speaking easily motivates her clients and audiences to rethink their day-to-day choices by implementing simple fixes for home, health, relationships and more.